Rafting: A great team experience! Once on the rafting boats, you will experience the thrill of white waters: waterfalls and rapids. There will of course also calmer places where you can take a dip or simply admire the surrounding landscape. A unique and safe opportunity to discover the wonderful world of rivers! 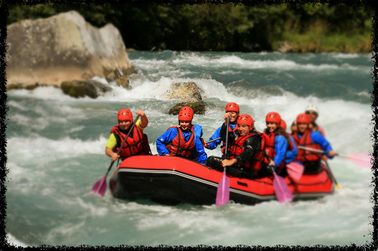 Rafting is an original team-building experience: enjoy the wilderness and a share the thrills! The Arve (Geneva) is a nice mixing river falls and rapids and calmer places. An unforgettable experience in the heart of Geneva and accessible to all! Dranse (France): mixing sports, river rapids and beautiful landscapes. This is one of the finest courses in Europe, boasting a 23km descent.